These small pots which were found in the proximity of today's Baghdad are the best candidates for electro-chemical devices found so far [ Baghdad Battery ]. The oldest were found in a Parthi settlement, which was inhabited around the time of Christ's birth. The discovery site - a presumed hill which coincidentally was found to be an ancient village in 1936 - suggests even a later settling. The other pots even might have to be settled into the period to 1200 CE. From this, any usage of such devices in ancient Egypt seems to be very improbable. Right from the beginning the chief excavator Wilhelm Koenig had the opinion that these pots had been batteries used for galvanizing items. Some finds and writings led to the belief that the Parthians knew a method of coating copper or silver with gold by using gold cyanide - without the use of electricity. With a reconstruction of the supposed battery the galvanizing rate could be quadrupled. Such devices were unly useable once. If they were used in large numbers in daily life, remnants of them must have been found somewhere. This is known to the propagists of this idea, too, so they strip down the usage of electric light to "sacral purposes only". The situation gets scizophrenic here: On one hand the author show a problem (soot) which only could be solvend (in their opinion) by massive use of electric lighting, on the other hand they reduce their theory to a small scale sacral use themselves. Their own theory therefore can not solve the problem created to initiate the idea! The performance of a battery is the product of voltage and amperage (volt times ampere). The voltage is a material constant between different metals. If we place two different metals in acid we can measure an electric difference measured i Volts.. This difference is independent from the size of the plates, it only depends on the materials used. The difference between two plates of the same material is null. Therefore you can sort the various metals into an electro-chemical row with the most negative elements (giving up electrons) to the left and the most positive ones (collecting electrons) to the right. This principle is known to us for approximately 200 years, and the best combinations for metals are known almost as long. The "batteries" found in Baghdad however are quite poor in comparison. Some contained only same metals (copper rods in copper cylinders) and can produce therefore no voltage at all. And those few who could contains the metal pairing copper/iron which are only 0.5 volts apart on the electro-chemical scale. This excludes any systematic research of the phenomenon which would be the basis for the development of a lamp. The second factor for a battery was solved nearly as inefficient than the first. The amperage depends on the surface of the used electrodes. An ideal battery possesses two electrodes with surfaces as large as possible, with materials lying apart as far as possible on the electro-chemical scale. For example disk batteries like the famous Volta pile, which consisted of copper and zinc plates. Or our zinc coal batteries, whose central electrode is an activated charcoal staff with an active surface as large as several football fields. The relics of Baghdad are there poor, too, they came with single rods of iron with a minimal surface as counter electrode. This is another sign against a systematic research of electricity. In 1995 I made a reconstruction of a Baghdad-type battery myself. My first try was a disaster: The reaction stopped after a few minutes. After some research I found the reason: Such natural acids which could have been used (I used vinegar) need air to react. Therefore the closed original constructions never could have worked as batteries! After I drilled several holes into the cylinder it produced about 0.4-0.5 volts with open contacts, and had a short circuit amperage of 50 mA. The electrical "performance" adds up to 25 milli Watts without connected devices (which breaks down to 1/10th with a single bulb attached). That means however, that for the operation of only one 1 watt-bulb the ridiculous quantity of forty batteries is needed! Since each battery weighs approximately 2 kilograms, the Egyptian flashlight without rack and wiring would weigh around 80 kilograms! Oh, after approximately 8 hours power output the inside of the battery decomposes into a green, poisonous mud which must be disposed of. And the soldering on the bottom gave way, too, so that the whole mess fell into the cylinder I had placed below the metal cylinder. 17,400 tons of this metal more precious than gold was needed. In the television broadcast "Aliens - do they return?" by Erich von Daeniken, already addressed by me in the pyramid section, he tried to make a connection between Baghdad batteries and light in his typical way. He tried to suggest that a gas-discharge lamp could be powered with such a battery. So he connects a digital multi meter to the battery - a loud buzzing noise suggests a high voltage. Then we can read a not defined voltage of "0293" on the meter; afterwards he presents a "reconstruction" of a Dendera-type gas discharge lamp also connected with a meter, and gives the impression that both voltages are of the same amount! When Volta experimented with its (by the way 10000 times more efficient) batteries, he lived in the age of the research and progress. Each detail, each improvement was published and hundreds of scientists around the whole globe were busy with the study of nature and exchanged their results in innumerable publications. Nevertheless it lasted nearly 200 years until the induction was discovered, and out of this in the end the generator was developed. This needed an unbelievable number of small steps, and each of these can be reconstructed from uncounted publications. After two pieces of circumstantial evidence have been eliminated we should now take a closer look at the objects themselves. I will start "technical", since the authors of the thesis asked for it. On the following pages I will show what Egyptology says about the pictures. I must start with some words of warning. The book "Lights of the Pharaohs" by the Austrian authors Krassa & Habeck (they wrote the most popular summary of the thesis, and I base my discussion on it) is nicely written and sounds logically sound. After reading of the book a laymen might ask himself, why Egyptology publishes such a rubbish about Egyptian history, since it seems to be completely different. But anyone with just a slight knowledge about Egyptian history sees at once, what a load of rubbish is poured onto the trusting reader. Most parts of the "history" the authors unfold are free inventions, therefore I cannot discuss those parts of the book - I simply have neither web space nor the time to correct everything they have twisted. I will stick therefore strictly to the objects and the technical and Egyptological discussions about them. Only some examples of Krassa/Habecks weird history will be discussed on an additional page at the end of this article. "If we evacuate a glass bulb with two metal parts reaching into it (B), (C), we can see a discharge at much lower levels, depending on the size of the glass balloon (D). At a pressure of about 40 t (tonnes) (40 mm of mercury) a snakelike light filament meanders from one metal part to the other (E). If we evacuate further, the light filament grows wider until it fills the whole glass balloon. 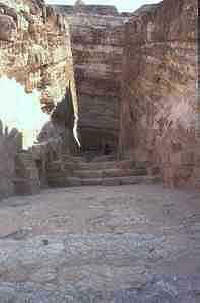 This is exactly what we see in on the pictures in the subterranean chambers of the Hathor sanctuary." This is the basis of the technical interpretation. Sounds logical, sounds comprehensible - and doesn't work! How so often in "fringe science" this lamp idea only "works" by omission of important details. You might have noticed that I emphasized the word "two" in Garns comment. Why? Because "two" is the key word. Every "normal" lamp needs two electrodes to produce light, a simple light bulb or the Garn-construction. "Well, and where is the problem?" you might ask. Simple. 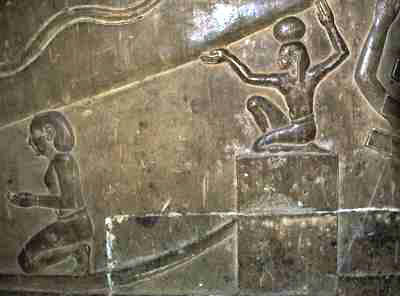 The problem is, that the "working" lamp picture in Dendera is only one of six. And from all six pictures this is the ONLY one where something reaches "into" the "bulb"! The only possible (and really used) explanation was: "The Egyptians saw the whole thing just a short moment, so they couldn't remember how the thing really looked like". But you must admit that this is silly. As you remember: the core of the lamp-story is, that the Egyptians used those things centuries, even millennia, to routinely light out their pyramids and tombs. And yet they could not remember how their daily tool looked like? Even the "reduced model" (which also contradicts the initial no-soot-"evidence"), that only priests hat this magical instrument and showed it a few times a year to the astonished masses, fails, because they had to have the objects at hand and could have copied them. If we take in account that the "working" model is dramatically outnumbered by the non-working types we can only conclude that the idea is, from the scientific viewpoint, flawed. In science an idea is only interesting if it can at least everything other ideas can explain, and it is really interesting if it can explain some things even better. But there are more problems demolishing even the basic idea that those things could be light bulbs of any kind. Krassa/Habeck seem to believe that the objects on the pictures are shown in their natural proportions with regard to the "priest" behind the lamp (although they are wondering, that some other people are shown smaller than the priest). If we use the priest as scale, the objects on the relief must be around 2.5 m long with a largest diameter of one meter, and a smallest diameter of 50 centimeter! Well, we don't need to guess, we can calculate it. With a length of 2,5 meters, a largest thickness of one meter and a smallest thickness of 50 centimeters we can calculate the volume roughly as a truncated cone of approximately 2 m length ( Volume = Pi * h /3 * (r12 + r1 * r2 + r22) and a hemisphere of one meter diameter (Volume 2/3 Pi r3). The combined volume is around 1,12 cubic meters, the surface of the object amounts to approximately 6,3 square meters. If the object is evacuated, a pressure of about 63 t (tonnes) would rest on a Dendera object. To withstand such an immense pressure, the object would have to be quite thick-walled, at least two to three centimeters thick. The weight of this bulb would be then approximately 750 kilograms. And this monster would be nevertheless a ticking time bomb: a small crack in the glass by uneven cooling with the manufacturing, and the Dendera lamp implodes with the force of a bomb. The fragmentation effect might be deadly in the periphery of several meters! "Rubbish" one lamp-fan told me, who dropped the Garn idea in a millisecond to defend the general idea (the people in fringe science are very flexible in switching even basic assumptions to keep a "mystery" alive). I was told, that the bulb could have been filled with a noble gas. "Antikes ägyptisches Glas gehört zum besten der antiken Welt. Trotz seiner technischen Ausgereiftheit ist sein Ursprung und seine Fertigungstechnik noch unvollkommen verstanden. Lucas (1962:179) bemerkt, daß, obwohl Glas sporadisch vor der 18. Dynastie (ca. 1550 BC) auftauchte, dies wohl eher ein glückliches Nebenprodukt von Unfällen bei der Fayence-Fertigung war, während spätere Herstellungen eindeutig geplant gewesen sind. ... Von 1500 BC an taucht Glas als reguläres Produkt mit hohem Prestige in Ägypten auf." Let's have a look at some negligibilities I noticed along the way. Krassa/Habeck are enraged (like many of their colleagues) by the interpretation of things as "symbolic" in scientific publications. Disgusting. Paleo-SETI is much more straight forward, they need no symbolic hogwash to explain things. Well, aside, of course, of the symbols Krassa/Habeck also need to explain their construction! 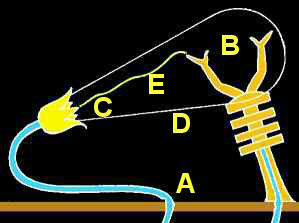 The two facing persons below the bulb are transforming to a "symbol for alternating current", the woman before them becomes a "symbol for electric current", the ape with the two knifes (identified only a few pages earlier correctly as protection god Upu, but with a crazy interpretation) mutates within a few pages later from a &"symbol for high voltage" to "Thot, bringer of light" - a "symbol for light". That's really funny, because Egyptology needs fewer symbols to explain the whole scenery, as I will show on the following pages. The next argument was, as expected, the famous "looks-like"-argument of fringe science. As long as there is no other plausible explanation, so the consensus on the former A.A.S. discussion board, there is no reason to see something else in those objects. Because the Dendera objects look so much like our modern lamps that other interpretations simply make no sense. Strangely. In the pictures above you see a set of current and older lamp constructions. Halogen bulbs, Spot lights, fluorescent tubes - and none of them has even the smallest resemblance to the Dendera construction. Even the sodium high-pressure lamp on the right, although a little similar on first look, is completely different in size, structure and mode of operation to its Dendera counter piece. Particularly I miss the so eminent important arms reaching into the lamps. So dear reader, if you know of any lamp in technical use now or in the past - please, send me a picture. Unless then I see no reason to interpret the Dendera reliefs as lamps. By the way: we often hear about "reconstructions" of ancient "artefacts", but those normally don't deserve that word. Like here those are in reality constructions designed in a way, that they look like parts on ancient reliefs or fit more or less badly written descriptions. Other objects are for example the Maya motor or the Hesekiel shuttle from Blumrich [ Ezechiel , Ancient Astronauts Theory ]. A lamp construction that looks like Dendera is possible but makes no sense. It has its reasons why we use small bulbs and not 2.5 m Dendera monsters. No, not really, the authors are telling only half the truth. 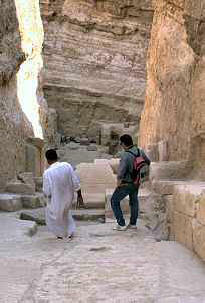 It is true that the location of the temple was used since old times, at least back to Khufu's reign. The technical interpretation of the Dendera objects on the last page left open some unanswered questions. So let's look now what Egyptology has to say about these reliefs. Would you be astonished if I say that these are pictures of "cult objects"? "Cult" is a definitive bad word in alternative archaeology, because in the opinion of many alternative authors "cult" is always used by school science when they cannot explain the real meaning of an object. But ancient man, so they argue, was much more intelligent than school science accepts, and had no need for useless cults (althogh this opens a new dilemma: on one hand our ancestors were too intelligent for cults, on the other hand they were too stupid to stack more than two stones without the help of "gods"). The main point of cult-oppositionists is: If there IS no cult, we can interpret these objects technically with the "looks like..." method. And the answer to why there were no cults is the rethoric counter-question: "Were the people in ancient times not as least as intelligent as modern day people? Why should they have more cults than we? And we intelligent people from today HAVE no cults." Well, they can't be serious with the "cultless modern time". There are some buildings called "churches" around, which can be seen as "cult centres". Yes, there are cults celebrated there (communions, christenings, church service...) connected with cult objects (crosses, tabernacles, altars). "Yeah, but that's all", said a cultless-fan in a discussion. Here we meet him again, our old friend, the context. The way some authors work - pulling some details out of the context and molding them together to create a new reality - will produce spectacular results, but no reliable ones. The same here. 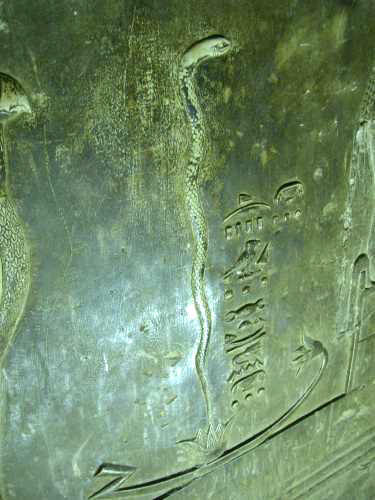 Egyptian reliefs have the characteristic not to be located simply connectionless in the area. We find them usually in temples or graves. Unlike our "general-purpose churches" Egyptian temples normally served special purposes. If the Dendera temple served a light God, or perhaps even a "unknown instructor from the stars" for example - well, this would be a good sign. Unfortunately, the temple serves no star god. The Dendera temple and its crypt, in which the mysterious figures are, serves exclusive one purpose: The yearly cycle of the sun, the New Year and its celebrations. The complete temple is dedicated to this topic. The crypt had also a practical function: It served to keep of the statues shown on the reliefs for the celebrations, which were gotten out to the ceremonies. The texts in the crypts, which are translated although some authors state otherwise, leave to it no doubt (e.g. " hidden place of the smn pictures "). In the texts can be found which purpose what statue had, how big they were, what materials they consisted of and what was done with them during New Year's Eve. So what have lamps have to do with New Year's Eve? The text, which belongs to the relief, explains all its parts showing only the new year topics shown above. The main theme is the sun having its last day in the old year and its first morning in the new year. We can read this clearly enough: "Resomtus alive with gloss in the sky (and) lives at the day of the New Year celebration". That is in a way the heading of the whole scene. The oval which contains the snake is according to some authors a light bulb and the snake a light filament. 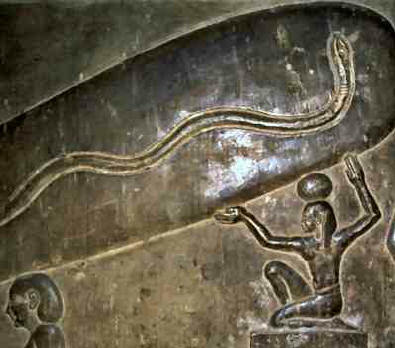 Apart from the fact that snakes in Egypt never represented "light" (and that I know of no lighting snakes) the oval had in Egypt a define meaning: It was a symbol of the morning sky, in ancient Egypt "Duat"! 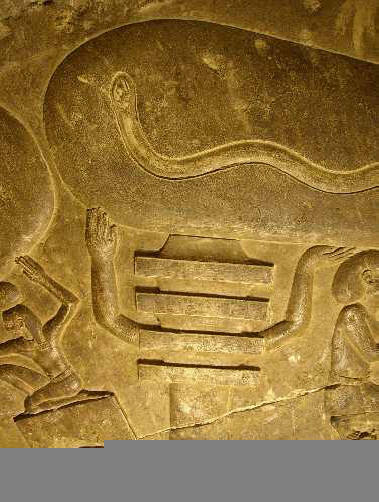 The snake represents, as in many other pictures, the god of the morning sun, Harsomtus. But why, say the skeptics, should a snake be a symbol of the morning sun? Quite simple. The Egyptians noticed that snakes shed their hide and were believed to renew with each shedding. Almost as the morning sun, which comes up every morning renewed. And the sun moves like the snake without visible outer organs. Especially in Greek-Roman times from 300 B.C. on Harsomtus is always depicted as snake. Therefore Harsomtus appears in Dendera in all cases as newborn sun, and not as a filament - it would be widely out of the context. A substantial point in the light bulb argumentation is the Djed column. Since it is not exactly known what it represents, it is assumed to be an electrical insulator by some authors of the paleo SETI faction and integrated into the light bulb thesis. However, as we already saw in the technical section, the "lamp" is depicted in three different forms. 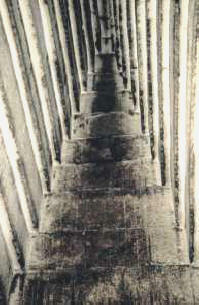 One in its "functioning" form with the arms from the Djed pillar inside the "bulb". Twice however in completely 'un-isolatoric' :-) manner: Once completely without the Djed pillar - embarrassingly, if it should be a so important item for the lamp case, and once with the "glass bulb" itself resting on the Djed pillar with the arms outside the bulb. In this case the Djed pillar cannot have been an insulator - because glass itself is one of the best insulators known. What is correct is that we do not know the origin of the Djed form. It could have been many different things. But the hieroglyphic, the sign which used the Djed pillar as a word, was used exclusively for the word "lasting" or "stability" - at all times of the 3500 year long history. The occasional use of the symbol as "support of the sky" supports this meaning additionally. In the bulb representation the Djed supports the morning sky, which corresponds accurately with the conventions. So we can translate "Djed" in many cases just directly with "column". This quite crucial point is not at all registered by the proponents of the lamp thesis. Why - whether from unawareness or because it can destroy some beloved theory - is unknown to me. But in the texts to the lamp reliefs and in the pictures there is no other meaning for Djed than "lasting", as the writings unmistakably prove. Until today no attempt was made to state why in this representation does not to apply in these pictures. 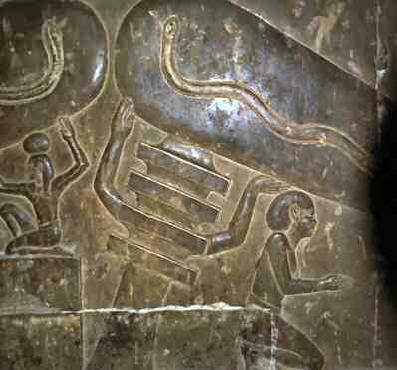 The "light bulb" of Dendera has on the foot something like a socket, into which a "cable" runs, which is connected on the other side with a "generator". This is the description we can read in the more fantastic literature. But the cable is no cable. It is, as we can read directly in the texts describing the scene, a symbolic sun barge, a boat in which the sun floated across the sky. All this is written in the texts beside the objects. 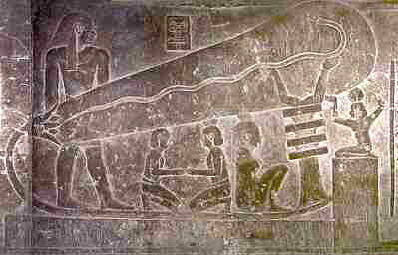 Neither is the form of the barge shown in Dendera unusual. In many symbolic barge representations the boat only consists of a string like object which forms a bow and a stern. And on the horizontal platform between we find normally gods and objects connected with the sun or the sunrise. One of these objects connected with the sun barge, and normally located at its stern, is the lotus flower. This can be seen in Dendera, too. It's the so called "lamp socket"!! The ancient Egyptians believed that the sun originally came out of the first hill coming out of the flood of creation (the crypts in Dendera were accurately under this place, so was believed). 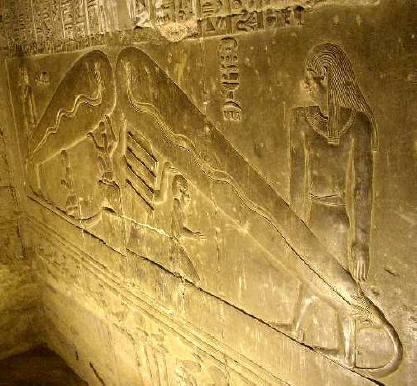 One version of this was that the sun child (usually Nefertem) climbed out from a lotus flower - the same thing Harsomtus does in form of a snake in the Dendera pictures. A lotus flower is no lamp socket - it doesn't look like one, and the inscriptions explaining the pictures simply state its a lotus flower. The lotus flower was used e.g. for the production of ointments. The God Nefertem, the Memphitic version of the sun god, was even called "The Large Lotus Flower", who emerges as the first thing from the receding waters and started creation - that is much too far to expect from a lamp socket :-) . 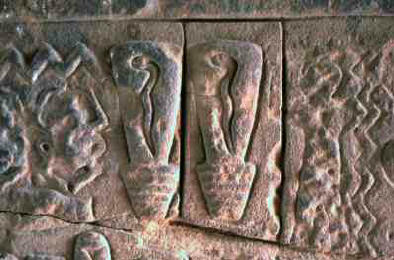 Lotus flowers looking similar to the ones depicted in Dendera were often shown in desk scenes, and they were the coat of arms plant of upper Egypt - the Knights of the Lamp Socket?? If the objects in Dendera would indeed show lamp sockets, some texts and interpretations would really be more than a little funny. The figure in the center is called Ka, and the connection of the texts on the north wall suggests that it is the Ka of Harsomtus. Ka is a type of physical soul and no "priest handling a device" as some authors propose. The God on the "box" is Heh, the carrier of the sky, which supports the rising sun, a scene thousand-fold to be found in Egypt. Heh is like Djed a symbol for eternity - it defines however the cyclic eternity, contrary to Djed, which is for the "continuing" eternity. That is not by any means ridiculous, but has something to do with the way the old Egyptians saw "time". There were objects which lasted forever - the sky, the sun, the earth. But an eternal sun wasn't the guarantee, that the sun returned from the kingdom of the dead every morning! This was guaranteed by the cyclic eternity, represented by Heh. The pictures in the east represent the sunrise, whereas the pictures in the western spaces D and E show the sunset. And again without lamp. With this knowledge, the three forms of the "lamp" objects suddenly make sense: In the first picture Djed carries the Harsomtus to make it eternal, and Heh the morning sky to let it come again in all eternity. In the second picture supports Djed the sky to make it eternal, and in the third one Heh to let it come again for all eternity. Both Reiliefs face each other directly. The technically absolutely unreasonable arm position of these pictures gives now a unique sense. The Djed, the Duat, the Barge, Harsomtus, the Ka, the snake, Heh, etc. are foundations for whole theologies during all of ancient Egypt. All of these are well understood and give no room for misunderstood technique. For example, the Djed became since oldest time in combination with anch (life) and Uas (welfare) a luck symbol. No place for insulators. Almost as old is conception of the Djed as carrier of the sky, a canopy could rest therefore on four Djed pillars - why should a ceiling rest on insulators??? The Djed occurs very often in pairs. 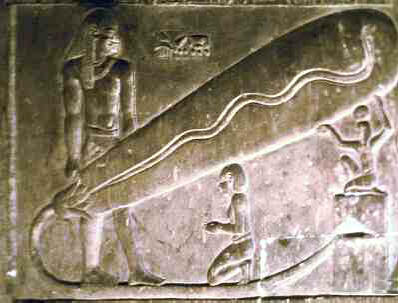 The Djeds is called then Schu (sky carrier) and Tefnut (in this case likewise sky carrier). The list could be continued easily much further, but these examples should be enough to see that there is no place in the Djed to be an insulator. "Surprisingly the texts of Dendera contain actually essentially technical data and paragraphs, which can be linked problem-free with our "electrical hypothesis". Not only this: They represent an ideal, meaningful supplement and support our interpretation in an amazing way." "An egyptologist may be a specialist in his area, but is he able do detect electrotechnical knowledge in old texts and pictures? Hardly. He would probably never comt to the thought, because school book science anyhow categorically excludes this possibility." Resomtus is alive with gloss in the sky (and) lives at the day of the New Year celebration. He lights up in its house in the night of the child in his nest, by donating the light to the country from the birth bricks. The sky is jubilant, the earth is pleased and the God chapels is glad, when he appears in his chamber in his procession barge at his beautiful celebration of the New Year. The God with his disk has come to see him. Nehebkau gives him reputation, and the goddess with her disk, with godly body, rejuvenates him in his sanctuary. Tchnt tpjt jnr (probably the goddess Thoeeris, a birth goddess) is content because of her majesty. She praises Re because of him with praise for his Ka, with wine from schfjt (wine area) and meat bits on the altar before him. 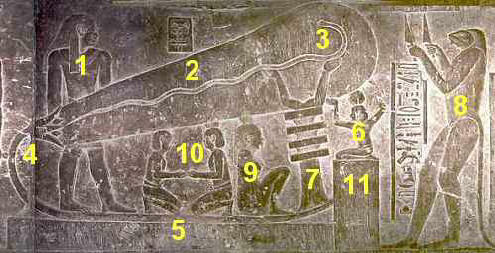 The "land-of-Atum" (= Dendera) is prepared with his most distinguished plan, as Hu and Sia are subordinated to him. He may protect the son of Re (empty king cartouche), forever. Bringing of the amuletts (Pektoral) made of gold. Speak: To speak words: This is the protection of your majesty for the celebration, in ktmt gold. Ihi: Words to speak of Ihi, the great, the son of the Hathor, the noble child with shining plait: I please your heart with glories for your person, and I drive rage out with spells. King: The king of upper and lower Egypt (cartouche with the name of Ptolemaeus XII. ), the son of Re (cartouche with another name of the same king). I came to you, to your place (destroyed section). Beautiful one, whose looks are perfect. I have the Amulet of gold (destroyed section) attached with live on the day of the celebration (destroyed section) of your body. Isis: Words to speak of Isis, the great, the gods mother, lady of jat dj, who stays in Dendera, the beginning with whose arrival the earth began, turquoise skin and lapislazuli like head. Harsomtus: Words to speak of Harsomtus, the great god who stays in Dendera. Gold, height: 4 hands. Made of metal the Day barge, the lotos flower from gold (this section is about the statues kept here, which were brought upward (room G)). Ihi: Words to speak of Ihi, the great, the son of the Hathor, Re in its shape of the great God, who appears with the diadem as a king of jztj (Egypt)and as a master of the Sed festival,: You reign Dendera millionfold from the nhh eternity to the completion of the Djed eternity. Gold. Height: 1 cubit. Harsomtus: Words to speak of Harsomtus, the great, who stays in Dendera, the living Ba in the Lotus flower of the day barge, whose perfection the two arms of the Djed pillar carry as its seschemw picture, while the Ka's on its knees are with bent arms. Gold. All precious stones, height: 3 hands. Harsomtus: Words to speak of Harsomtus, the great, who stays in Dendera, who is in the arms of the princes in the night barge, the noble snake, whose chntj statue carries Heh, whose crew carries his perfection in holyness, because of whose Ba the appearing (Hathor) in the sky appeared, whose shape is admired by admirers, who comes as unique, enveloped by his head serpents, with numerous names at the point of chw.n=sn (Gods with relationship with the Hathor), the sechm-picture of Re in the "Land-Of-Atum" (= Dendera), the father of the Gods, who created everything. Gold, metal, height: 4 hands. Isis: Words to speak of Isis, the great, mother of the Gods, lady of jat dj, who stays in Dendera, the queen of the rchjt people, with pointed horns. Come in peace, servant of his Lord, as the chw djeser priests are subordinated to you, and you protect my throat with your trusty behavior. I have myself pleased about the freshness of your character. Gold. Height: 1 cubit. Even if one does not understand the contents of the texts, which admittedly sound rather confusing without previous knowledge, one should perhaps believe this time the Egyptologists or at least accept the mention of the New Year celebrations as main theme. Clearly visible is the fact that there is not the smallest suggestion which could justify an interpretation as light bulb in the texts. The function of these rooms was to keep the cult statues which were necessary for the celebrations mentioned. Further references to these absolutely clear circumstances supply the other walls of the rooms, whose texts are not shown here. As found so often, the whole theory is based on the complete neglect of all results of scientific archaeological work. The light bulb thesis is pure fantasy without empirical core, based solely on the "looks like - was then"-method and takes no consideration of any facts - even not to those written in large "letters" right beside it. In German speaking countries the idea of "electric lighting" was brought to a greater public by two Austrian authors, Reinhard Habeck and Peter Krasa. I could not find any reference to them on any English website, so i believe that they play no role outside Austria/Gemany/Swiss. They even seem to have occupied the idea from a Scandinavian author whose book I unfortunately could not get yet. Because of the irrelevance of Krassa/Habeck in the rest of the world I will not bring my critique of their book here. But in the book they use some tricks do make the Hathor temple mysterious, that I have found on several English wep pages about Dendera, too. Therefore you can find these few examples here. To make the Hathor temple mysterious enough it must be old. Very old, prehistoric if possible. Because we could hardly speak of an influence for pharaonic Egypt, if the first and only temple containing such pictures was from, lets say, about 50 B.C. Therefore the "lamp authors" declare the temple to be old. Their first piece of evidence: The "Zodiac of Dendera", located on top of the temple, is prehistoric! The zodiac is a kind of a small orrery, hewn into a rock, with a diameter of about 3 meters. When the orrery is prehistoric, the temple beneath must be much more prehistoric :-) simple. The ozodiac shows the constellations of the stars and the planets and is prehistoric, because "the represented constellations do not correspond with those of our time". But: Analyses of the zodiac made for example by the mathematical-astronomical section at the Goetheanum showed, that the zodiac does not represent an astronomically possible constellation, since for example Venus and Mercury are to each other in an astronomically impossible angle. It is therefore no real representation, but a symbolic overview of all planets and constellations which could be seen during the years! By the way: The zodiac cannot be prehistoric - it can be at its oldest from 332 B.C. Why? Because it shows the constellations in their Greek forms! Therefore it cannot be older than the year the Hellens conquered Egypt - 332 B.C.! "It remained reserved for the French archaeologist Augusts Mariette to find in the middle of the 19th century in the crypts of Dendera [...] in yet completely unknown relief figures. Additionally they contained a hieroglyphic writing, which had only little in common with the well-known hieroglyphs on the Rosetta stone. Hieroglyphics from an older epoch of old Egypt, which could not be dated exactly yet, whose decoding has now begun." Anybody with even rudimentary knowledge of Hieroglyphics will now protest. Fact is: The old Egyptian writing consisted mostly of syllables. A hieroglyphic usually represents one consonant, which forms a syllable with a not represented vowel. The old writing got along therefore with relatively few characters. Beyond that there was a number of symbols, which contained several syllables (consonants), as well as a collection of "real" picture symbols and determinatives which should suggest, how a word is to be interpreted. All in all approximately 750 characters. At the beginning of Egypt history. All these characters are well-known and their interpretation undisputed. Much later, more than thousand years after the end of the pyramid era, Egypt became the playball of its neighbors, who attacked, annexed and ruled the country now and then. And all were fascinated by hieroglyphics and began to add own characters. At the time when Egypt was a Roman province, about the 8000 hieroglyphic symbols were used, some of them were found only in one or two reliefs or writings - to guess their meaning is very hard and often cause of great debate. The fact that the Dendera inscriptions are to be translated with difficulty, is therefore a sign for a relatively young age of the Dendera crypts! "The outstanding event of the building and religion policy P.s ' XII. is the inauguration of the Edfu temple on 7 February 70.